Measuring 14 ½ x 20 inches the Polyconic Projections were first published in the late 19th Century. Some were produced by the Army, others by the Corps. of Engineers and the remainder were produced by the United States Geological Survey (USGS). The scale is 1:62500. The contour intervals vary. Measurements are shown in miles, feet and kilometers. The final maps in the series were produced in the early 1970’s. 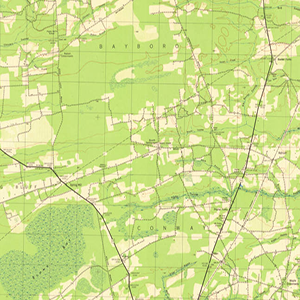 All later Topographic Maps of South Carolina are produced by the USGS in their present 7 ½ Minute format. The later 15 Minute maps created were reproductions of earlier editions, due to lack of sufficient changes in the area covered and by lack of funding submitted by the State. At the time, the State was expected to contribute funds toward the production of the maps.